University of Cebu accountancy students graduated as Certified Public Accountants and experienced a perfect graduation day. The students achieved this feat through hard work and with the guidance and support from the UC faculty and administration. Usually, students graduate first before reviewing for the CPA board examinations. But these students from the University of Cebu Banilad Campus College of Business and Accountancy became CPAs first before their graduation ceremony. As early as May 2013, Sheena Fernan, Jan Erika Go, Camille Anne Garcia, Wenceslao Pepito, Katrina Montenegro, Marilyn Escabas, Lowell Lloyd Cañete, and Ronalyn Alaraz, started their final semester in accountancy. This gave them a month’s leeway in finishing their course requirements and preparing for their board exams. They took the CPA board exam last October 5, 6, 12 and 13, 2013 and the results were released on October 21. They all passed with flying colors. The Professional Regulation Commission said 4,246 out of 10,396 passed the Certified Public Accountant Licensure Examination this October 2013. 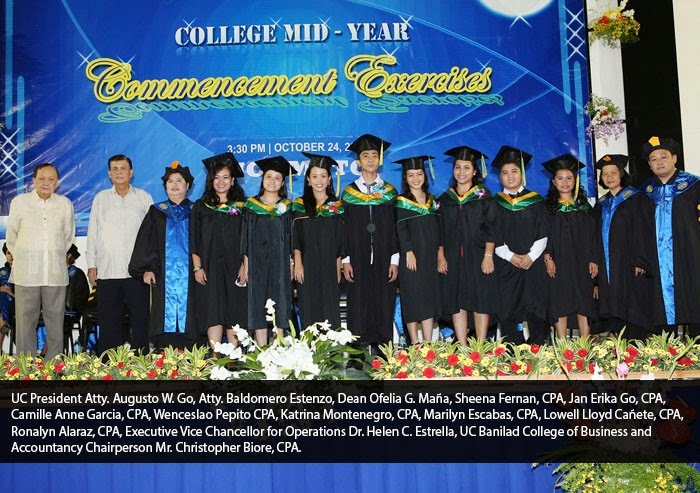 So it was another perfect graduation for these students as they walked up the stage on their Graduation Ceremony last October 24, 2013 at the University of Cebu Maritime Education and Training Center in Mambaling, Cebu City. Challenges give us strength and difficulties shape us into better persons. Such is the case with Evangeryl A. Muñez, the University of Cebu graduate who gained first place in the Customs Broker Licensure Examination. Evangeryl and her younger sister were raised by a single mother who works as a household helper. Yet despite the odds, Evangeryl became the high school valedictorian and went to the University of Cebu to seek support for college education. At UC, she learned that being a valedictorian enabled her to become a full incentive scholar if she took a four year course with a board exam. She decided to take Customs Administration at the UC Lapulapu Mandaue campus, which was situated nearer to their home. Evangeryl also received an allowance from the University President Atty. Augusto W. Go. So it was a sweet surprise when she learned that she topped the board examination. And as icing on the cake, UC President Atty. 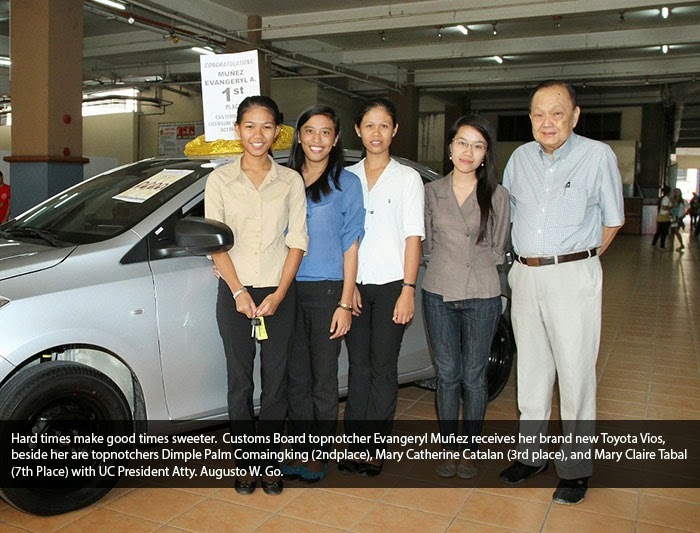 Go awarded Evangeryl with a brand new Toyota Vios for making the university proud. At the University of Cebu, it has been proven time and again that poverty is not a hindrance to gaining quality education. Aside from Evangeryl gaining first place, UC students Dimple Palm D. Comaingking also gained second place, Mary Catherine C. Catalan third place and Mary Claire L. Tabal seventh place. All of them are graduates of UCLM College of Customs.